Why choose this play kitchen? Why choose a Little Tikes Play Kitchen? Because you will come to love the unique design and unique features these toy kitchens have to offer. Ultra modern kitchens have everything today’s little cooks want, including a food prep area, and an island peninsula for serving. Just pull up a stool and eat! It includes the latest decorating looks from stainless steel appliances to “granite” counter tops and sleek cabinets. The solid build and superior finishes make this our favorite toy kitchen from Little Tikes. Electric burner makes real cooking sounds- i’m sure your kids will love the realism of it. small stainless toy refrigerator, stainless cooker and two cabinets. well crafted accessories for boys and girls. This amazing Little Tikes play kitchen won many awards. It is crafted with awesome details for the most realistic role playing experience your toddler can get. This play kitchen has a two-sided play environment that lets kids choose between cooking up a storm in the kitchen or grilling their buns off on the backyard patio! The grill has neat electronic starting and cooking sounds and cool fabric flames to enhance play. It also has a large sink with a modern style faucet spacious oven and dishwasher with rack. A pass-through window allows little chefs to serve their creations easily. The outside is no less realistic – it features siding a stone patio stylish fabric canopy picnic table and bench and pretty posies to pick! Throw in a stylish chefs hat and the included 27 piece accessory pack and its easy to see why kids will love it. The interactive Play Smarter Cook’n Learn Kitchen by Little Tikes encourages young kids to learn to cook and to cook to learn. Intended for ages three and older, this play kitchen comes with 37 accessories including a wide variety of plastic foods, cookware, and utensils. The kitchen itself features a refrigerator, oven, sink, stovetop, counter, and storage shelf. 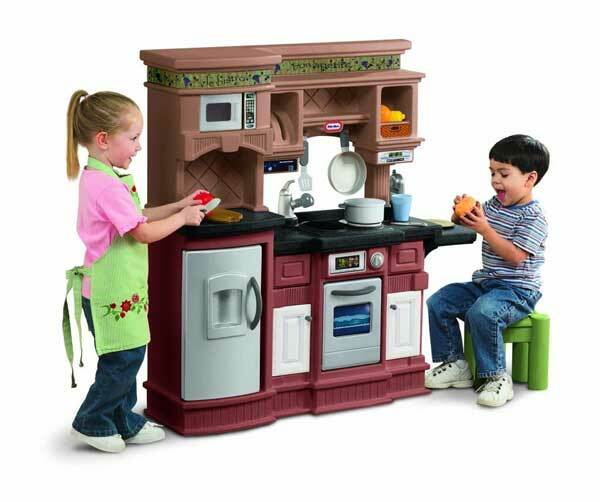 But this is no ordinary kitchen from littletikes.com. When it’s turned on, if the kid puts food on the built-in cutting board or in a frying pan on the burner, the kitchen recognizes the food and names it out loud. Great learning toy, no? Plus, the kitchen has an interactive recipe game mode that helps kids learn how to follow directions as well as to recognize foods, food groups, colors, numbers, shapes, sizes, and textures–all in an encouraging and fun way. This kitchen comes with a place setting and three recipe food sets: Breakfast, Cutting Fruit Salad, and Veggie Stir Fry. The kitchen is made out of durable, easily wiped-down plastic and an internal electronics and speaker system for the kitchen’s food recognition and voice abilities. The oven and the fridge both have doors that swing open and closed, and a handy little towel rack hangs over the space where the included wastebasket nestles. The recipe cards slide neatly into a holder on the back wall, providing a handy reference when gathering ingredients at the start of each game. Each recipe food set has two levels, offering you two games per recipe card. The kitchen’s upbeat, female voice speaks in rhymed couplets and often breaks into enthusiastic snippets of song. If a child makes a mistake, the voice remains friendly and encouraging–and each successfully completed step is met with abundant praise. At the end of a game, the kitchen busts out into a fun song about the lessons learned. It is very durable and encourages learning by active, social, and creative play. 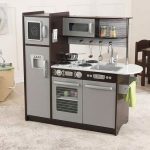 This compact kitchen is a great addition to any play area. It is compact, stylish, and modern. 2 AA batteries needed are not included. Some features: Cute cabinet door opens with storage inside, A pretend working microwave and oven doors, Clicker knob above the oven door, toy burner has electronic cooking sounds, pretend refrigerator with door that opens, room inside to store food,Chrome look towel rail. This gorgeous wooden kitchen and laundry center offers everything the little homemaker needs. It features with a double burner stovetop, oven, dishwasher, a clock and refrigerator with ice dispenser, microwave. This laundry center comes with : a washer, a dryer , laundry basket, pullout ironing board with iron, clothes hooks, granite-look counter top, double sink, roomy storage shelves, telephone, chalkboard, metal pots, pans with accessories, and spice jars. So, Little Tikes is one of our favourite play kitchen producers for what it offers. If your kid doesn’t like Little Tikes kitchens, Kid Kraft is another great choice for them.